Combine warm water, yeast and sugar and let sit for 5-10 minutes. It will look a little bubbly and smell very yeasty. Combine the flour and salt (I use my standing mixer with dough hook. Make a whole in the center of the flour and add the yeast-and-water mixture along with the olive oil. Stir to combine. Adjust consistency with flour or water. Knead the dough for 5-10 minutes (here’s where I get to set the timer for 10 minutes and walk away :-)). The dough should be smooth and elastic. Cover and put in a warm place to rise for about an hour (until doubled in size). If you don’t have a warm spot, turn the oven to 50-75 C (120-170 F) briefly until warm. Turn off oven and place covered bowl in oven to let rise. After dough has risen, punch it down and divide into golf-ball sized pieces. Roll the dough into desired shape. Preheat a grill pan and lightly brush the dough with olive oil. Place the dough on the grill until it puffs up and is able to hold its shape. Turn it over and grill on the other side. You might need to re-flip dough; you’re looking for a crunchy dough with nice grill markings. Preheat the oven to 190 C (375 F). Place dough on a baking sheet. Lightly brush the grilled dough with some olive oil. Lay the speck on the dough and dot with pieces of taleggio (you can break pieces off the taleggio with your hands). Carefully pour beaten egg onto each dough. I sometimes don’t use all the egg as it sometimes does not set in the nooks and crannies. Sprinkle with Parmesan. 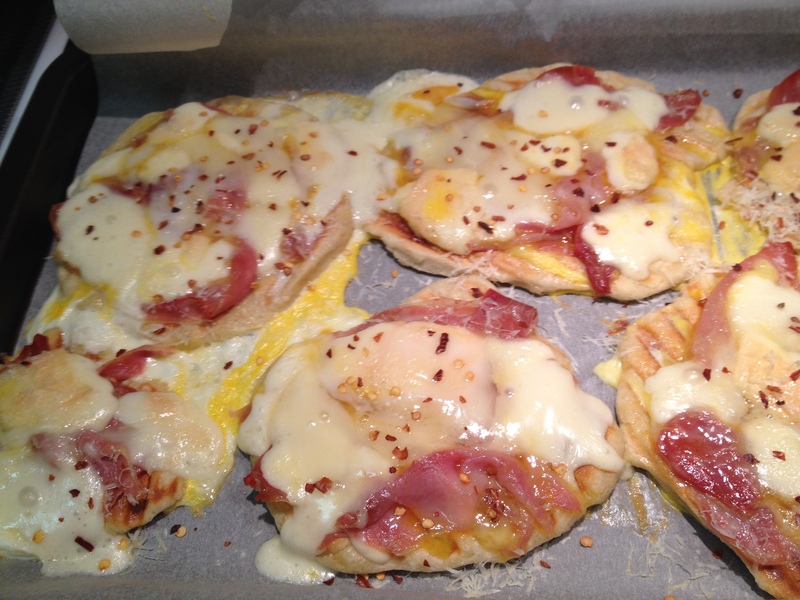 Bake the pizzettas in the preheated oven for 3-5 minutes or until the eggs are set. Sprinkle with crushed red flakes. Serve immediately. Recipe by Anne Burell as featured in: New York Cooks; 100 receipes from the city’s best chefs. Available on Amazon.